I love mushrooms, all kinds; wild, domestic, exotic. When I am at Costco, I cannot pass by the huge pack of portobellos without putting one in my trolley and I cannot walk by the mushroom stand at the farmers market without buying a very expensive bag of exotics. Most of the time I have a vague idea of what I am going to with them, unfortunately, they always just end up in the same old thing. As much as I love mushrooms, they always stump me (kinda like artichokes). The exotic mushrooms I don’t mess with them too much. I usually prepare them very simply and we have them as a side or as bruschetta on some rustic bread. The poor portobellos always end up in either soup or beef stew. This was going to be the fate of the pack of portobellos in my fridge the other day. 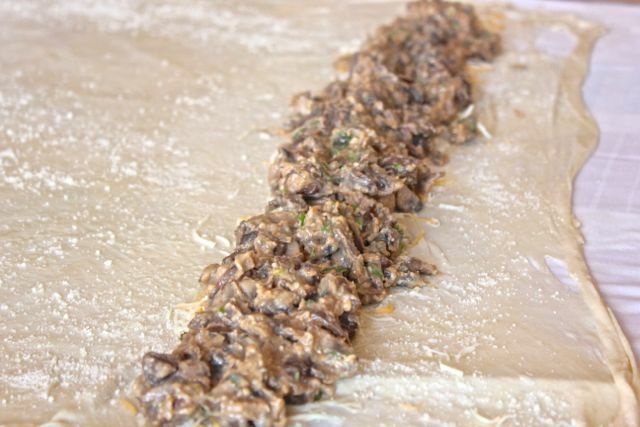 They were destined for a pot of stew when their path was miraculously changed (only because the beef was used to make another dish and I didn’t have any more) To introduce a vegetarian dish into the weeks menu, I decided upon a mushroom strudel. I was also out of phyllo sheets so I made my strudel dough. 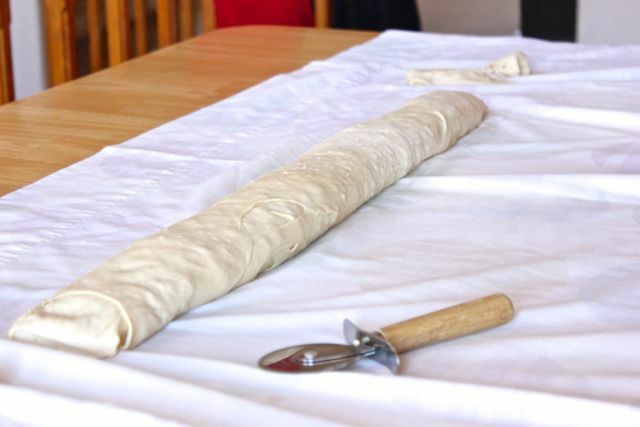 I have made it before and it’s surprisingly easy but a little time consuming and does require some patience to roll and pull the dough thin enough. If you don’t want to mess with making your own, just use phyllo sheets from the store and make individual rolls or make it into a pie. If you need a visual on either method, I have two posts that illustrate the method: Kale, Feta and Potato Phyllo Rolls and Potato Cheese Phyllo Pie. The strudel turned out amazing. The dough crisped up nicely when baked with the inner layers turning out flaky and buttery but tender at the same time. The filling was creamy and fragrant from the thyme and nutmeg, and hearty with the mushrooms. I added a layer of Cheddar cheese and though it was great; melted and creamy, you don’t need it and I will probably leave it out next time. I have a strudel dough that I have been using for the past year and it has worked out wonderfully for me, but either I wrote it down and lost my paper or I have it filed so meticulously in my many computer apps, that even I can’t find it now! There happened to be a strudel dough in my Kaffeehaus cookbook by Rick Rodgers and it was very similar to my old one. I am going to post Rick Rodgers recipe, with a few quantity changes. I shall, however, do a separate post for the strudel dough since there are quite a few steps. Heat the olive oil and 1 tablespoon butter in a big frying pan on medium heat. Add the onions and sauté till lightly golden. Add the garlic and cook a little. Add the mushrooms and sauté until they are nicely browned and most of the liquid has evaporated. Add the paprika and the thyme, cook a little. Add the last tablespoon of butter and melt. Add the 2 tablespoons of flour and cook a little to get the raw flour taste out. Pour in the milk a little at a time until the sauce thickens. Make sure to stir through the mushrooms to get all the flour mixed in. Bring the sauce to a bubble and once it thickens and coats the mushrooms, turn off. Add 2 tablespoons of Parmesan cheese, a few shavings of fresh nutmeg (or a dash if you have ground) and the parsley and mix together. Let cool before filling the strudel. Once the strudel dough is rolled out, brush the dough with the melted butter. Dust with the 2 tablespoons remaining Parmesan cheese. Lay the cooled filling at the bottom edge of rolled out, trimmed strudel dough. Sprinkle with optional cheese if using. Pull the sheet and allow the overhanging dough to fall on top of its self. 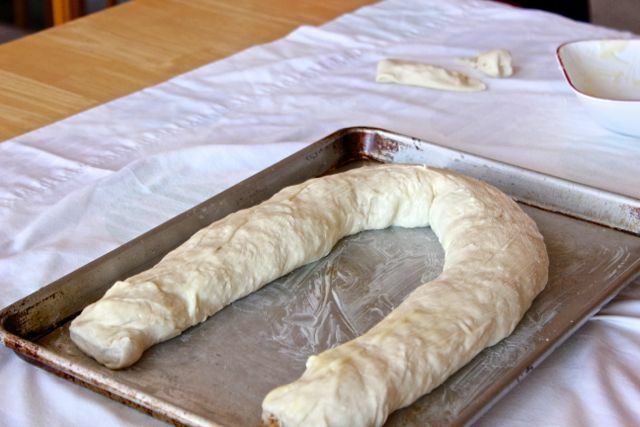 Using the sheet, roll the dough over to form a strudel or log shape. Brush with butter and place on a greased baking sheet. Place in the centre of oven and bake until golden brown, about 35 minutes. The mushroom strudel made a nice change and it was great to enjoy mushrooms in a different way! Do you all get in the same rut? Do you find yourselves making the same dish with the same ingredient? I hope this post has inspired you to try something different with your one reliable ingredient. This looks incredible!Who wouldn’t want this? YUM! I’ve just stumbled across your blog thanks to your tweet about #teatimetreats – so glad I did because it looks like you have some fab recipes and this is definitely one of them! Thank you Natalie for your kind words! I am so glad you stopped by …nice to know Twitter does work! OMG I love this! Bookmarking it now because I love mushrooms + strudel! Thanks Natalie! I hope you enjoy it! Thanks Shuhan! Eastern Europeans fill their phyllo sheets with all kinds of neat things besides sweet stuff, so I figured why not? I especially love the boreks. Its my daughter who loves mushroom the most in our home and I make mushroom strudel for her with phyllo pastry. But making your own dough would be something nice. It’s quite fun to make actually. Kinda stretch and pull the dough, the holes aren’t fun though. This sounds delicious and looks even better. I’m in awe of anyone that makes their own strudel dough. I’ve seen it done and the stretching amazes me. Your opening photo is tantalizingly good! Thank you John, I appreciate the compliment. I am not an expert at the dough but it’s not too bad. I love the idea of presenting mushrooms in this way…fantastically unique, my friend! Thanks Angie! Makes a change. Oh, I love mushroom but hubby not so much reason why I don’t buy mushroom as frequently as I would like to eat. The strudel looks divine. Thanks Lail! It’s hard when you have someone who doesn’t like something you like. I make it anyway 🙂 and make them all eat it. 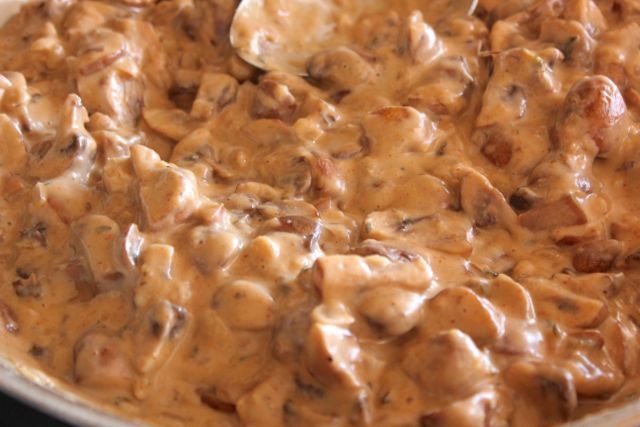 I just HAVE to tell you that I adore mushrooms and I adore creamy sauces and I super adore pastry! All together, this is heavenly!!! Ahhhh!!! I want to scream because it looks so delicious! Will be trying this soon! Oh Nazneen! This mushroom strudel looks divine!!! I LOVE mushrooms, so can’t wait to give this a try! Beautiful step by step photos! Have a nice evening! Thank you so much Carol, I appreciate your kind words. I do hope you try it, it was quite tasty. i don’t cook with mushrooms too much, maybe it’s coz my mom didn’t make alot of mushroom recipes, while i was growing up. That’s a shame coz i love mushrooms in my food…hehe. i like how i can use phyllo OR strudel dough to make these. btw nazneen, your pictures are GORGEOUS! do you submit them to foodgawker and tastespotting coz you really should! 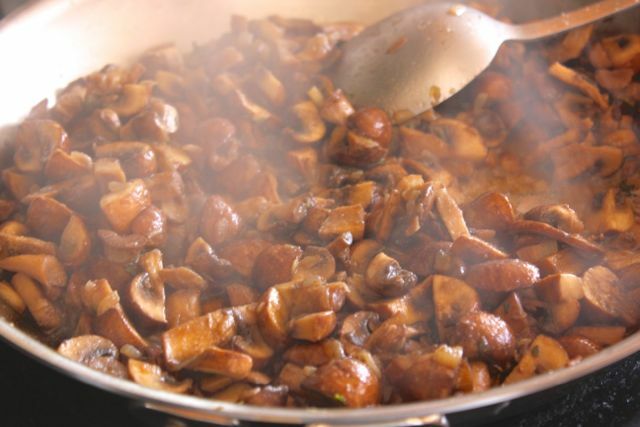 I don’t think South Asians ate much mushrooms…my mum never cooked with mushrooms either. I began to eat them later in life and cook with them all the time now. Yes, phyllo and strudel are interchangeable really, I think phyllo tends to be thinner. I do try very hard to get my photos on those sites but it’s like 1 out of 15 gets accepted! If one takes it the other doesn’t. Honestly, I think their criteria is bs..it’s whoever sitting there that day and whether they like it. How different this strudel is!! I have eaten sweet strudels but have never tried a savory one. Thanks for sharing this exciting recipe, Nazneen! Denise Browning@From Brazil To You recently posted..Ravioli Soup (Sopa de Ravióli): Love at first bite! Thanks Denise! Many eastern European countries have some great savoury strudels called boreks…they are amazing.